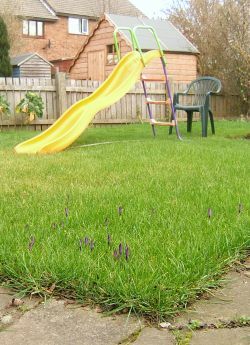 Inspired by a tree on the corner between the cathedral and the theology department where crocus magically appear every spring, I planted some crocus bulbs under a little portion of the new lawn in our back garden last year. They bloomed a lovely purple last spring so I was eagerly awaiting their appearance this spring. But each day went by with no crocus. I'd wander out with my morning coffee in hand to inspect the lawn in a fruitless search for crocus buds. Where are the crocus?? Did someone eat them? Did they rot away in the winter rains? Imagine my surprise when I looked out the kitchen window this morning to see an array of purple peaking out through the (too tall and needing mowing...but too late now) grass. Where did they come from? What a happy day. I really enjoy my walks into town as the seasons change throughout the year. I especially like the late winter and early spring because each day brings a little new appearance of life -- buds reddening, bulbs poking up, people starting to gather at the allotments to work the chilly soil. In a couple of months it will be difficult to remember what the bare branches looked like as they turned into lush green foliage. Who wants to go all the way to the Edinburgh Zoo every time you feel the urge to “Whee...Slide!”? 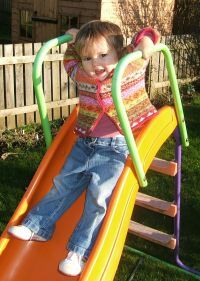 Imagine my excitement when I saw a giveaway “Whee...Slide!” appear in my Freecycle™ email. “Would it fit in a small car?” “Probably...I've got the allen wrench to disassemble it.” We borrowed our friends’ car, drove to the little pit village outside of Durham, and as soon as Ellie saw it, she gleefully screamed, “Orantz [i.e. 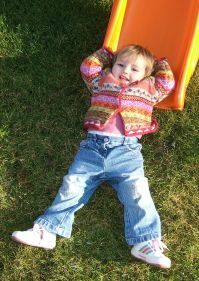 Orange....her favorite color] Whee...Slide!” She had no idea it would soon be hers. Eventually enough of the bolts came loose that we could carry the pieces over to the car. Fold down the seat, thread it through from the boot, aha -- it all fit! Watch the exciting video below. You'll hear her saying, “Again..again!” as she starts up the ladder. I'm sure she'll get the hang of sitting up while she slides down eventually, but this way is pretty fun.